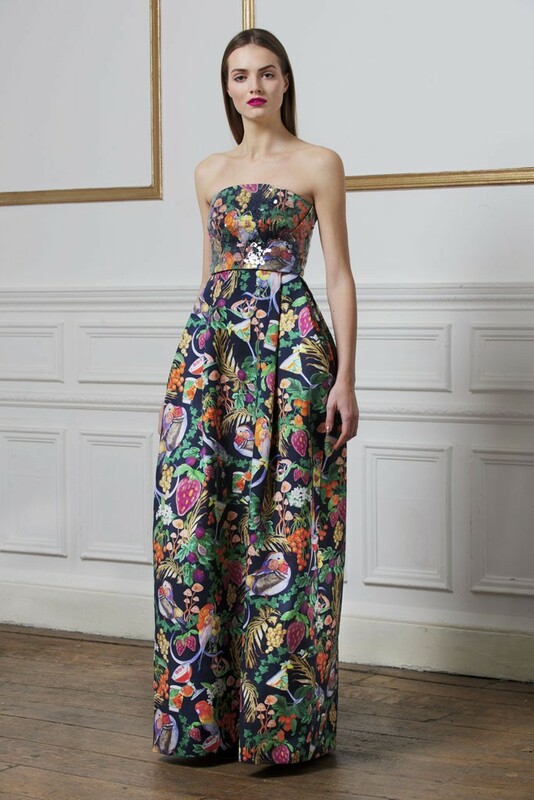 The Matthew Williamson Pre-Fall 2014 Collection features a print which was influenced by William Morris. Other William Morris-inspired collections : Ostwald Helgason Autumn/Winter 2013-2014 (William Morris was one of the references of this collection), Prada Autumn/Winter 2003-2004 (William Morris’ floral prints influenced this show), Valentino Couture by Maria Grazia Chiuri and Pierpaolo Piccioli Autumn/Winter 2012-2013 (this show included a printed coat which was based on William Morris’ « Tree of Life » tapestry). Sooo lovely! I love William Morris patterns and this one is a cheekier version. It that a Martini glass? Cocktails and Fruit? I ❤️ this series of posts focusing on art influencers – awesome! Ooooh, thank you so much for such kind words ! You now have the right to take one of the cocktail glasses off this fabulous print to warm you up, cheers !!! Someone I know would really rock in this gown. The designers have been really going at it with prints. The last several you chose to bog were just fabulous. Thank you so much, Ron ! I’m also amazed by the beauty and the originality of the Pre-Fall 2014 patterns : designers just get better and better at playing with them ! Thanks so much for another inspired comment ! Yes, Matthew Williamson’s take on William Morris is unique and so fun, I mean these giant strawberries are to die for ! oh wow!!! we love what Williamson did with this dress because the print is very playful classic williamson yet the silhouette is very elegant and royal! Thank you so very much ! This is a beautiful compliment, coming from an exceptionally talented artist like you ! Cheers ! Me too, thank you so much ! I love how Matthew Williamson has added fun elements to the print !